Buying new furniture is great! However, over time it tends to wear down and within the first few years cushion fabric can become ruined, chair legs break, and a multitude of other tragedies can happen. 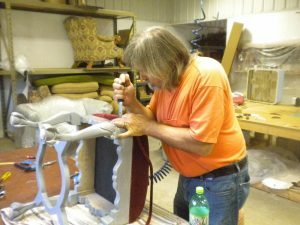 The question we get asked most is “can salvage the piece after it goes bad to look new.” Our first response is to try to locate the manufacturer’s customer service to obtain the parts through the company that sold you the chair. It is not a sure bet that customer service will be able to help, but you never know what is left in some parts bin by the furniture manufacturer. While a skilled craftsman may be able to make new parts, matching fabric in most cases proves to be challenging. Parts obtained from customer service are much less costly than someone making them from scratch. Over the years, we have had several customers that were able to find customer service helpful from the place of purchase and even were able to save hundreds by doing so. We will install the parts obtained from customer service if you are lucky enough to come across the right fit.